Today We’re talking about Dr. Jack Daniels, the man named “World’s Best Coach” by Runner’s World magazine. Daniels was a swimmer and shooter before he was groomed to compete in modern pentathlon bringing home medals in the 1956 and 1960 Olympics. But his mark on the world of running came after he went on to study exercise physiology and conducted the research that modernized middle and distance running training. His book Daniels’ Running Formula serves as the training bible to runners and coaches. It’s an incredibly complete reference on all aspects of training for middle and distance running. He is incredibly influential on my and many other runners’ training and has influenced just about every other running coach around. Whether you’re a running veteran or a newbie, super fast or looking to leave the back of the pack, Jack Daniels’ training philosophies can help your running. Read on! Jack Daniels training premise is that running performance is achieved through separate components: the cardiovascular system, running muscles, the ability to cope with and minimize lactic acid, the maximum oxygen uptake capacity, speed, and efficiency of the runner’s movements. Each system is improved by training at a particular intensity. Each run works at least one of these systems and when you put it all together over the course of a season, each run is a puzzle piece that comes together on race day. The other thing Jack Daniels is known for is his VDOT chart. With this chart, a runner can input a recent race time and find the corresponding training paces for that VDOT, or fitness level. This is really helpful because training plans are often ambiguous about what each intensity means. as we discussed last week, “tempo” can mean one thing in one training plan and something different in another! It doesn’t matter what training plan you are using. As long as you know the purpose of your workouts, you can use Daniels’ training paces that you are doing your workouts at the correct intensity. There is also a VDOT chart for determining the equivalent race times at other distances from a recent race performance (e.g. input last weekend’s 5k time to find out what you could run a half in in a couple of weeks). The VDOT chart works for any race distance. Obviously you run a 5k at a pace faster than you would run a half-marathon. Daniels used real data from hundreds of real athletes to calculate the VDOT formulae. Basically, Daniels eliminated the need to do complicated and expensive VO2max testing to determine training intensities. In fact, he says that this method is actually more optimal than laboratory testing. Below is a VDOT lookup for you and gives you training intensities in one step. If your training plan says Intervals, use your Daniels I pace, not your “as fast as you can” pace. Interval are run at VO2 max, not beyond it. It’s a controlled hard pace, not an all-out hard. Under Daniels’ theory, you will not gain any benefit by running intervals faster than this intensity. For the most benefit, Daniels says intervals should be between 3 and 5 minutes. This is often overlooked in other training plans. If you can’t can’t run a 5-minute mile, Daniels says you have no business running 1600m intervals and he believes you should keep your intervals at a distance you can complete in 3 to 5 minutes and your recoveries between 50%-100% of the time it took to run the interval. Marathon pace is specific to marathon training. If your plans has 5-10 mile runs at goal race pace, it’s marathon pace, duh! Technically, this is supposed to fall within the bounds of easy, but it will feel really aggressive at the beginning. That is why we put in so many workouts practicing marathon pace before we race. Most of your miles are put in at Easy pace. This is where you build aerobic capacity in your cardiovascular system and endurance in your muscle fiber. Easy pace is much slower than marathon pace and is more of a upper speed limit than a specific pace. It is below roughly 80% max heart rate. You should be able to carry on a conversation at easy pace. You get huge aerobic benefit from running easy miles, so don’t push the pace or skip them in favor of harder runs. Before you jump out the door or modify your current training plan with your VDOT intensities, remember the most important piece of Jack Daniels’ philosophy: you train at the VDOT determined from your current level of fitness to get faster, not your goal race. Racing is a quantum leap. More on that later. 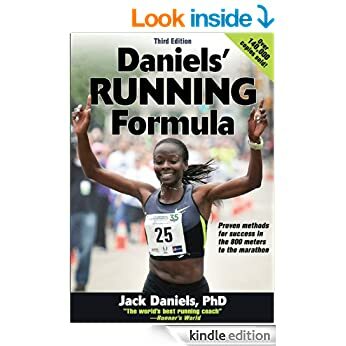 Daniels’ Running Formula is now in its third edition. The training plans in Daniels’ book are often criticized for not being appropriate for beginning runners or runners with lower mileages. Some of this has been resolved in the 3rd edition and paces were added for slow runners. There are lots of coaches who have written tons of training plans. Don’t feel any obligation to use one of Daniel’s plans. You shouldn’t have any trouble finding one that meets your individual experience and training objective. Regardless of which one you use, or even make up your own plan, you can use Daniels’ training paces with your training plan. Using the right training intensities for your current level of fitness ensures that you are stressing the specific body systems that will make you faster. If you’d like to purchase a copy of Daniels Running Formula, go here! Are you a disciple of Jack Daniels? Do you agree with his philosophies? That’s me in the far right of the photo! Jack and Nancy are the two greatest people you’ll ever meet. Caring and loving humans who would do anything for their athletes. So blessed to be coached by them! Wow! What a great experience!!! That is awesome! I was surprised to get a reply from JD, the Man, himself when I sent a question about the treadmill tables in third edition. I hope I get to run into him in person somewhere.